Does anyone know what it is? Hazard a guess? Appeared in the last 24 hours or so, somewhere in St. Werburgh's, Bristol. Roughly 18"x24"x 6" well padlocked black box strapped to a lamppost. Could be a misplaced theatrical prop?? It's possibly some traffic monitoring thing. Which road is it on? 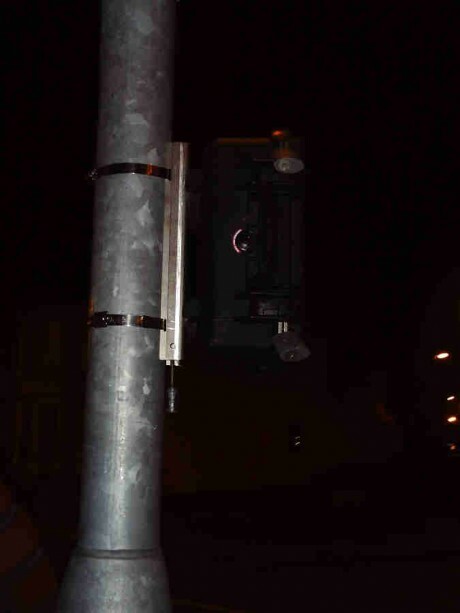 The really interesting monitoring kit doesn't need to be blatantly placed on boxes on lamposts. Everyone who carries a mobile phone is continually reporting which quadrant of a cellphone cell they are in; if you want to monitor phones with bluetooth discovery turned on, you can embed inside a lump of concrete, as the wireless signals go straight through it. Nobody gets worried about a new lump of concrete by the side of a road. The Bristol Traffic data pedestrian tracking experiment was lower budget -an old laptop running linux in a house. 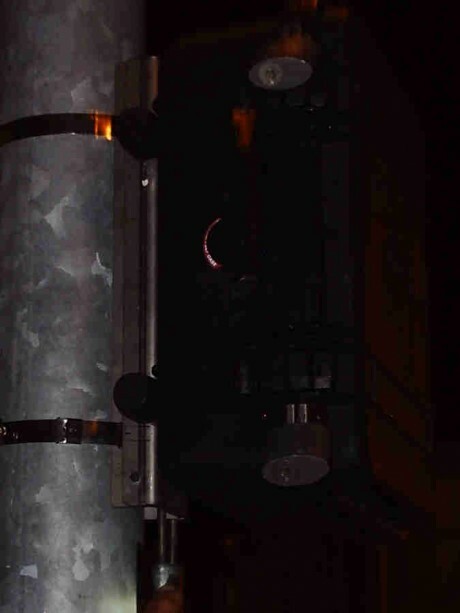 The fastening that holds the black box to the post in your pic resembles one that attaches a bus stop sign to an old lamppost on a steep, narrow, winding Clifton walkway. The path, reached via steps leading up behind St Peter's House at the Hotwells roundabout, is nowhere near any road. Perhaps that's why the buses never arrive on time - they've all been diverted - into the pedestrian byways of Brizzle?! Now we know where they got the idea from to run them along the Bristol to Bath cyclepath. Mind you, that's on the flat. In any case, could the two items - the black box and the bus stop sign - be related? We're talking city-wide here. Both have a transport connotation. Missing buses, and missing black boxes from 9/11. Or have those been found?